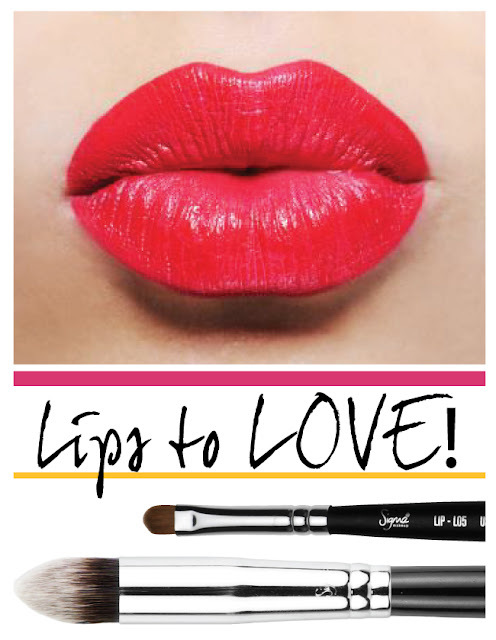 Do you love the look of lipstick but aren't exactly sure of how to properly apply? We’re here to help! When it comes to wearing lipstick, achieving the perfect pout involves preparation, proper application and some essential final steps. This is especially important if you are using bold and vibrant colors. Prep – First and foremost, you need to make sure lips are exfoliated. Exfoliated lips will guarantee smooth application of lipstick. It’s also a good idea to apply a light layer of concealer and loose translucent powder around the mouth to keep lipstick from bleeding. The Synthetic Precision Tapered brush (P86) is a perfect tool for that! Application – To make lipstick stay put, start by lining the lips with a lip liner and lightly fill in the lips. This creates a base for the lipstick to adhere to. Next comes the lipstick. It’s important to use a lip brush to achieve precise placement and even distribution when applying. Note: For those with thinner lips, stray from using darker lipstick shades as those may make lips appear even thinner. Last Steps – Blot inner area of lip to prevent lipstick from getting on your teeth. To make lipstick shine, apply a sheer gloss over top! Now you have all the essential steps on how to get that perfect pout! Questions, comments? We’ll take ‘em! Perfeitamente lindo e muito bem explicado! Parabéns!! Really nice! can't wait to try it.